Morning News Reporter Feng Xiaofei (丰晓飞). 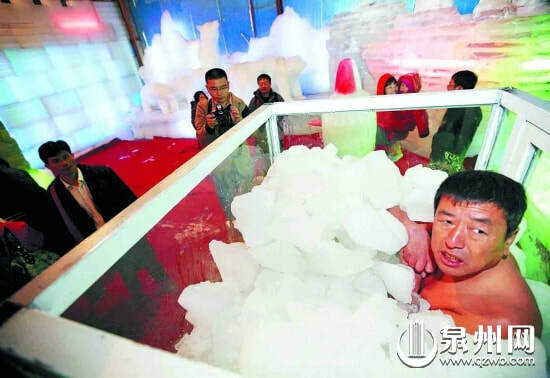 In a ‘ice house’ in Xiamen (situated in the Niutoushan Park area of Fujian province), people gathered to watch China’s ‘ice’ qigong expert – Master Chen Kecai (陈可财) – climb into a tank of ice (the temperature measuring just -5 °C) wearing only his underwear. Master Chen Kecai had to sit in the tank with ice piled-up to his shoulders with only his head and neck exposed to the air. In attendance were officials from Britain’s Guinness Book of World Records to strictly ensure that all the rules for attempting to break the ‘world record’ for being immersed in ice were adhered to correctly. As the ice was piled around the bare body of Master Chen Kecai – and as onlookers wore expressions of increasing concern for his well-being – he happily shouted ‘I am fine – do not worry!’ This event was an unusual public demonstration of the ancient Chinese art of ‘low temperature endurance’ – which is considered a part of very specialised Daoist practises that enable the practitioner (after years of careful training) to withstand extremely low temperatures with no damage to the inner or outer body. This rare technique of slowing the heart, slowing and deepening the breath, focusing the mind, expanding awareness, generating ‘heat’ and circulating ‘protective’ qi energy (around and through the inner organs and extremities) is known as ‘Resisting Cold Qigong’ (耐寒奇功 – Nai Han Qi Gong) – and those who can genuinely practice it are known as ‘Resisting Cold Strange People’ (耐寒奇人 – Nai Han Qi Ren). Due to the very dangerous nature of this type of qigong practice, obviously not many people are taught it – with even fewer practitioners mastering its techniques. This is why Master Chen Kecai’s public appearance took many by surprise, as people were not sure that this type of qigong was still properly practised in China. This reporter witnessed this event unfold from 11am yesterday. Master Chen Kecai had been practising walking, standing and seated meditation before calmly and unhurriedly climbing into the ice tank. When he was settled, 36 packs of ice were carefully poured around his body – ensuring there were no gaps or inconsistencies. Some in attendance expressed how incredible this spectacle seemed in modern China, and were impressed with Master Chen Kecai’s calm state of mind and body, and his dedication to the task at hand. Once firmly encased in ice, the official began to time the event. Master Chen Kecai looked happy and occasionally gave a re-assuring wave to the crowd as the minutes began to tick by 10, 20 and then 30 minutes… Reports state that Master Chen Kecai is 53 years old, and comes from Mudanjiang City, Heilongjiang Province. During his life he has participated in (outdoor) winter swimming, and from 1989, has been engaged in the practice ‘Resisting Cold Qigong’. Those who know about his low temperature activities have named him the ‘Ice-Man’ (冰人 – Bing Ren). Master Chen Kecai stayed in the ice tank for 108 minutes – and therefore broke the current world record. Following the event, and after a final check that everything had unfolded correctly – the representatives of Guinness Book of World Records officially confirmed that the current world record had been broken – and awarded Master Chen Kecai with a Certificate of Confirmation and a Medal issued from its Headquarters (for ‘Endurance within Ice’ [冰耐力 - Bing Bai Li]). Out of the 50 ‘extreme’ records associated with the Guinness Book of World Records – ‘Endurance within Ice’ is considered the strangest. For a long time, Chinese people never featured in the top 10 of the ‘extreme’ challenges – with the unusual and extraordinary Dutchman Wim Hof (维姆·霍夫 – Wei Mu-Huo Fu) dominating the endurance record involving ice coming into direct contact with the body. He stood for 1 hour 17 minutes in a tank full of ice, but on the 11th, November, 2008 this situation changed, when ‘Resisting Cold Qigong’ (耐寒奇功 – Nai Han Qi Gong) Master Wang Jintu (王金图) – from Quanzhou area of Nan’an (Fujian province) – set a ‘new’ world record for standing in glass tank full of ice for 1 hour 30 minutes. Wim Hof immediately responded by breaking this record – with 104 minutes in a tank filled with ice. It is Wil Hof’s record of 104 minutes that Master Chen Kecai broke with 108 minutes on the 27.3.2010. ©opyright: Adrian Chan-Wyles (ShiDaDao) 2017.